The teams continue their Greek adventure, as they must now fly to the island of Crete! 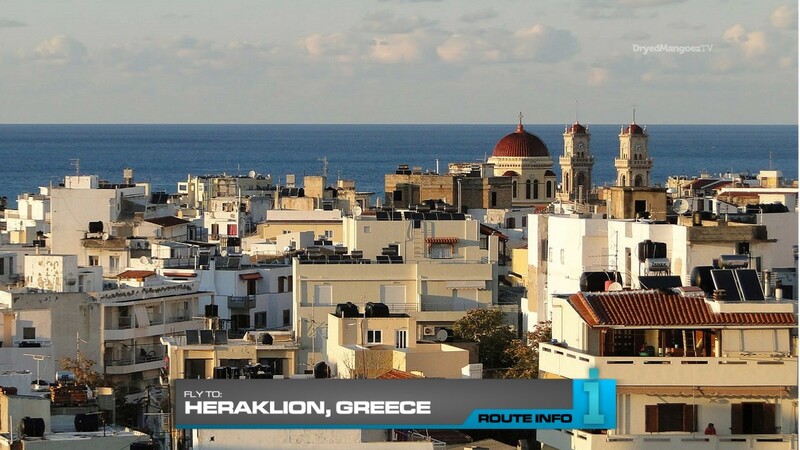 Teams will all be on the same Aegean Airlines flight arriving in Heraklion at 8:20am. 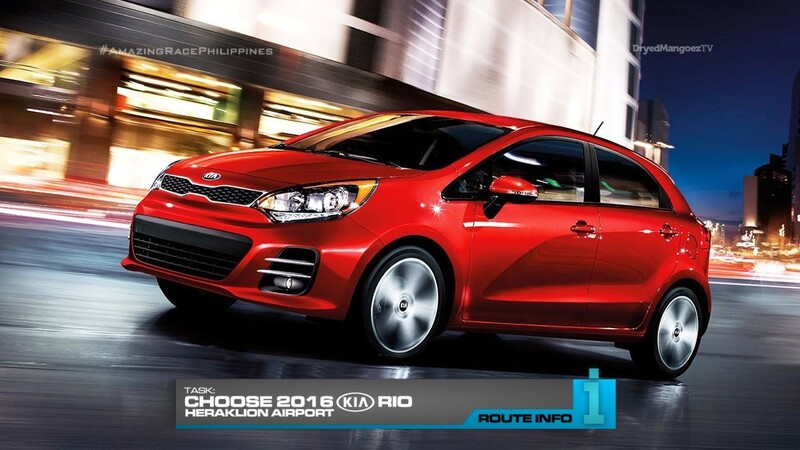 Once in Heraklion, teams must choose a brand new 2016 Kia Rio to drive on this Leg. 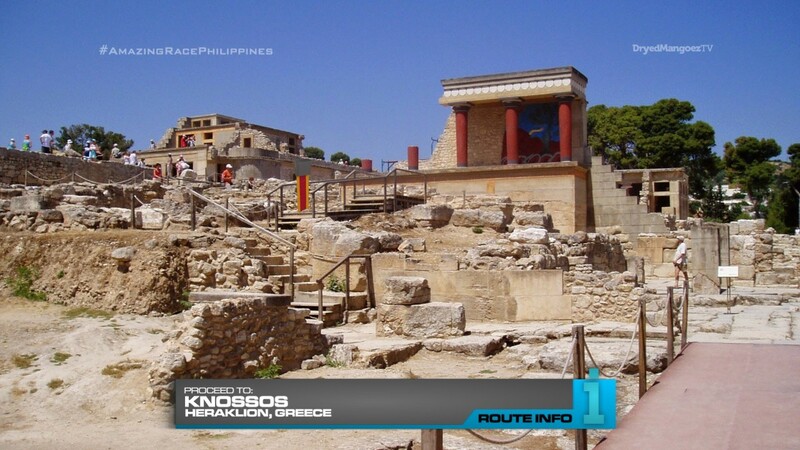 And teams must drive to Knossos for their next clue. 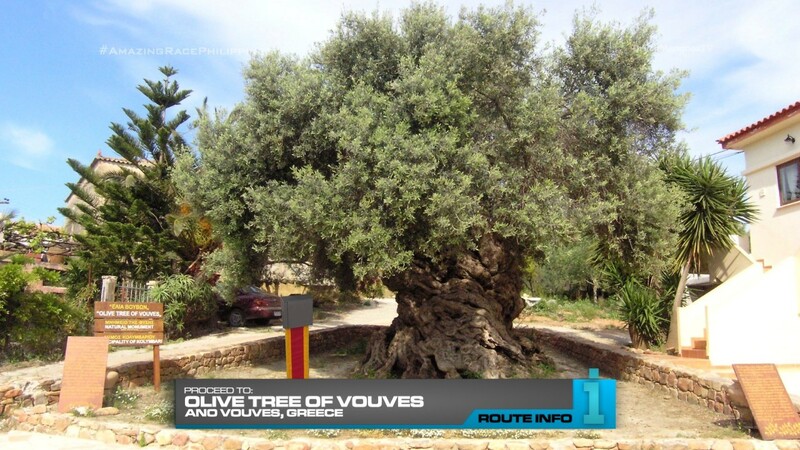 That clue directs teams to the Olive Tree of Vouves in Ano Vouves. Here, teams must check-in at the Double Yield board. Again, teams with a Super Yield may use it here. 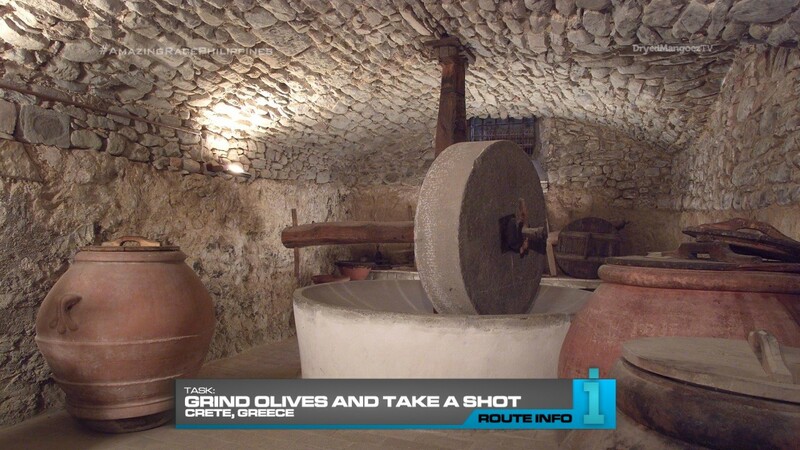 After, teams must use a miniature version of a traditional stone olive press to squeeze enough juice to fill one large cup which would then be turned into authentic Cretan olive oil. Each team member must then drink a shot glass of fresh raw olive juice to receive their next clue. And that clue immediately reveals the Detour: Traditional Leather or Modern Wind. 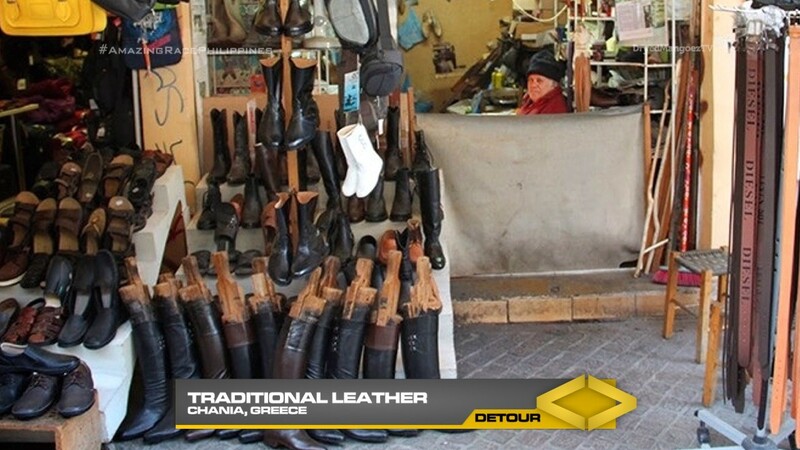 In Traditional Leather, teams must head to Stivanadika on Skridlof Street in Chania where they will make traditional leather custom boots and fit them on each other’s feet. Once their boots are approved, they will receive their next clue. 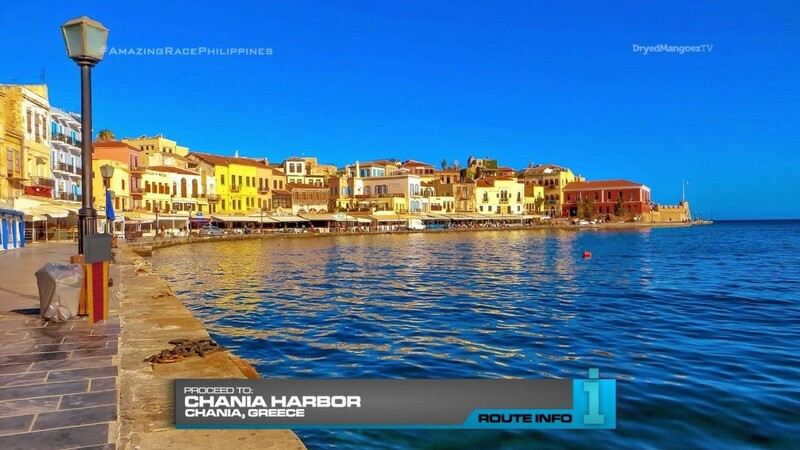 In Modern Wind, teams must head to Eleftherios Square in Chania to properly assemble two modern windmills common on the island of Crete. 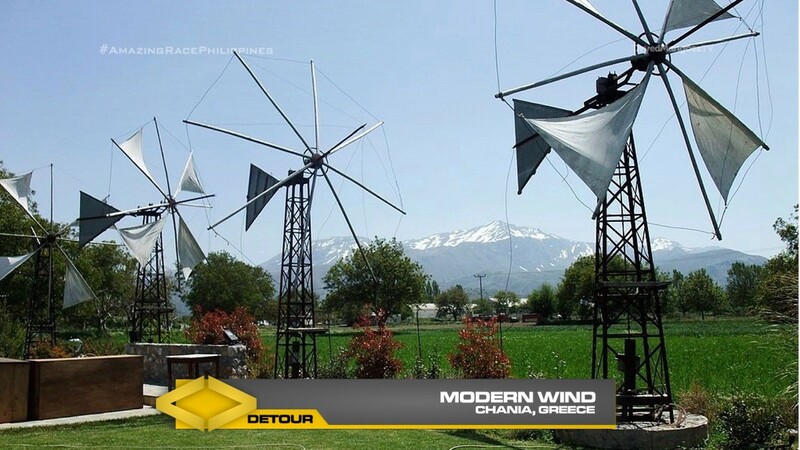 Once their windmills can spin freely, they will be given their next clue. That clue will immediately reveal the Road Block: Who wants to get in line? 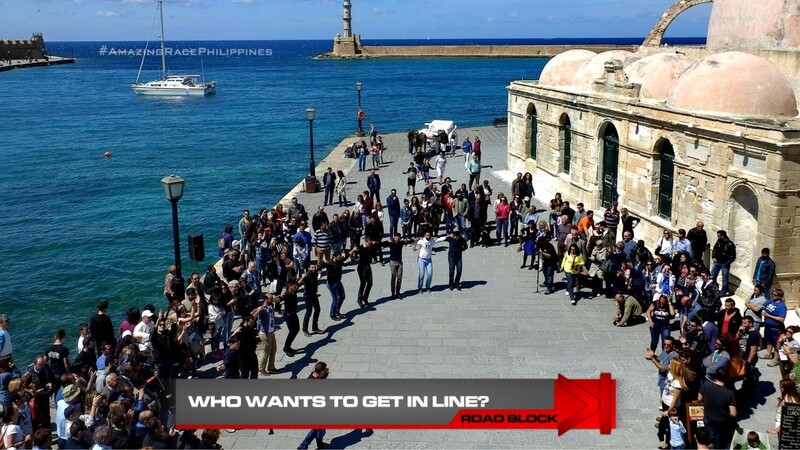 For this Road Block, teams must make their way on foot to Chania Harbor where they will learn and perform a traditional Cretan pentozali dance to receive their next clue. 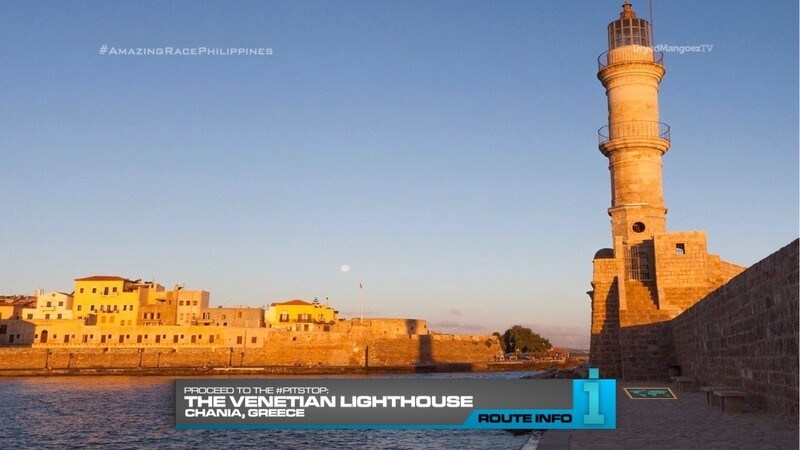 And that final clue tells teams to make their way on foot to the Pit Stop, the Venetian Lighthouse. Greece is a good country for two Legs. Especially since this Leg on Crete is definitely different form the city and history Leg in Athens. 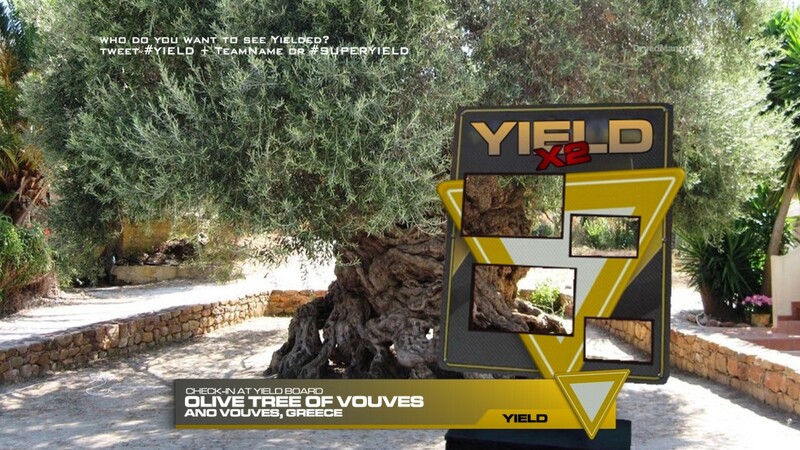 Crete is known for its olive oil, so this first task will be a good little task. Also a good spot for a Yield. The Detour focuses on making things native to the island as well. Two very different types of assembly. From here, teams will be on foot which should add a little bit of nice drama. That could also affect a team’s performance in the Road Block if the walking and previous tasks have already tired them out. The Road Block is straightforward. And the Pit Stop would be in another picturesque location with the possibility of the Road Block location in the background as teams step on the Mat. Fun! ← Recap: Kamen Rider Ghost, Episode 10 – Gathered! The Fifteen Eyecons!